JOHANNESBURG — Women in South Africa earn less than men, but consistently pay more across many categories of unavoidable monthly expenses including basic toiletries, grooming products, medical screenings and haircuts, a new survey conducted by leading financial services group Sanlam shows. The survey of 500 females and 500 males, which coincides with the start of Women’s Month, shows that while 98 percent of women claim to spend over R100 on monthly toiletries, only 23 percent of men do. Over 30 percent of women surveyed said they spent over R1,500 per annum on medical screening, versus only 1.2 percent of men. The majority of men, at 56.4 percent, spent nothing on contraceptives, whilst 51.2 percent of women purchased contraceptives monthly, with 30 percent of them spending over R100. Sanlam said many of the discrepencies came down to the so-called “pink tax”, noting how the #Axethepinktax movement was gaining global traction as increasing numbers of women objected to paying more “just because they’re women”. 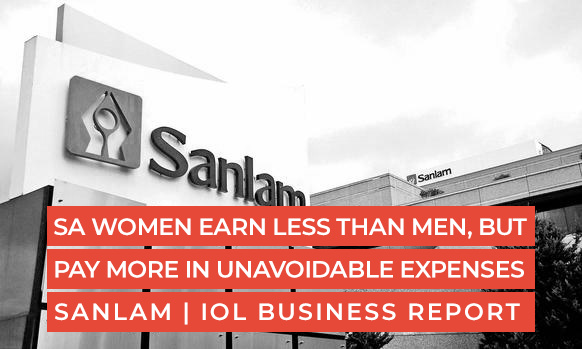 “To drastically oversimplify the situation, women are generally earning less and paying more,” said Danelle van Heerde, head of advice processes at Sanlam Personal Finance. Sanlam noted that Code for Africa, a gender pay gap tool based on the World Economic Forum’s 2017 gender gap report, had found that South African men earned about R6,607.25 more than women monthly, the sixth largest pay gap in Africa. “Now add to this the fact that women generally have to pay more than men for basic monthly necessities and one begins to perceive the full spectrum of challenges to women achieving financial independence,” Van Heerde said. Sanlam said women were paying the same value added tax for tampons and sanitary pads as they would for ‘luxury items’. Feminine sanitary ware is already beyond the affordability of many women across sub-Saharan Africa, with a UNESCO study in 2016 finding that one in 10 girls in the region missed school during her menstrual period. This has spurred businesses like Sanlam to engage in sanitary product drives to keep girls in school and Stellenbosch University’s law clinic has asked South Africa’s National Treasury to place feminine hygiene products on the list of zero-rated VAT items.